In Aquafan turbine powered cooling towers we convert water pressure into fan movement. The Aquafan cells’ fans are controlled via the system pump’s water pressure. The pumps are selected to generate sufficient pressure to drive the fan. It’s simple and efficient and saves energy and maintenance. For applications with a limited residual pressure, we can select a hybrid cooling tower design with a motor-assisted fan to achieve the required fan rotation to deliver the cooling job. Conventional forced draft cooling towers require an electric motor to drive the fan to create the airflow in the tower. 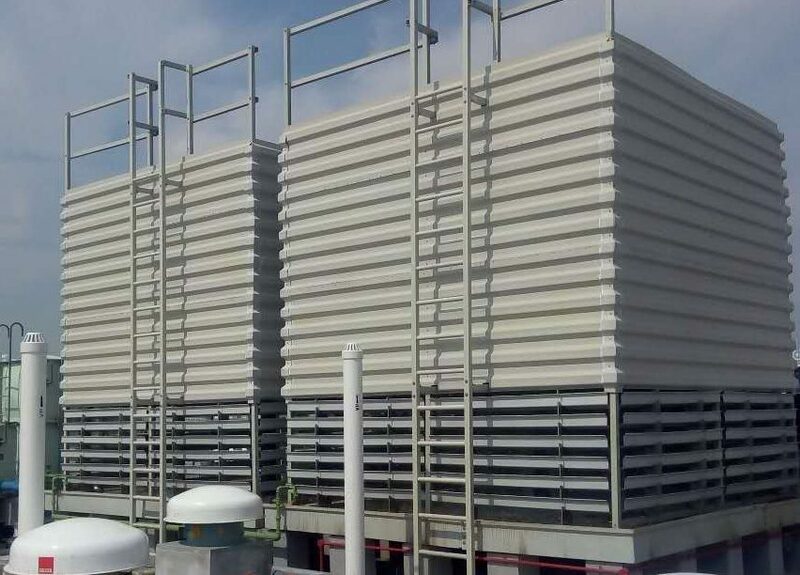 AQUAFAN cooling towers utilize the system’s water pressure to drive a water turbine. Consequently, energy savings of 30% and more are achievable. Unscheduled down time of water cooling towers involves substantial costs. Repair and maintenance of mechanical components (electric motor, drive shafts and gearboxes) can be minimized, as AQUAFAN turbines do not use these components and are therefore very reliable in their operation. 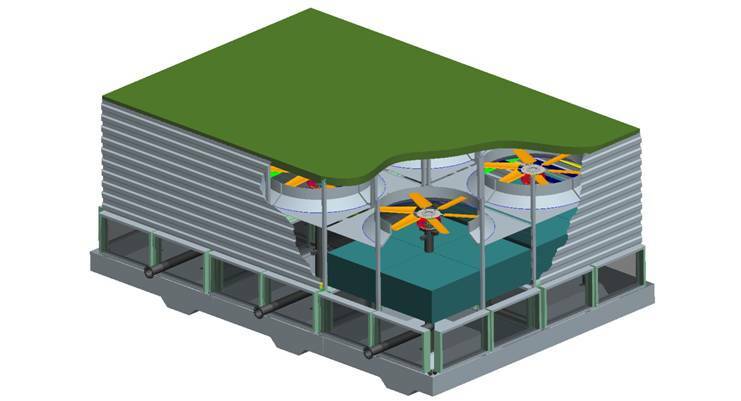 The AQUAFAN cooling tower design has an integrated fan-turbine combination completely made from corrosion free materials that are hidden below the drift eliminators. The box-shaped design of the modules can be perfectly integrated into the architectural design. 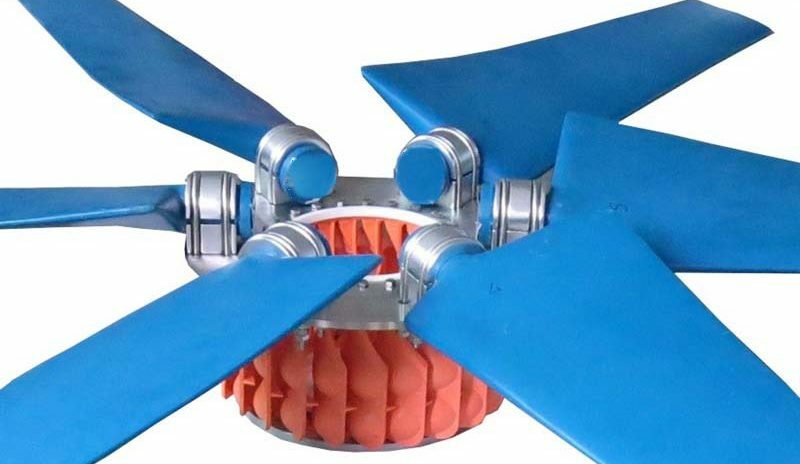 The driving force for the fan is generated from the energy supplied by the cooling water pumps. 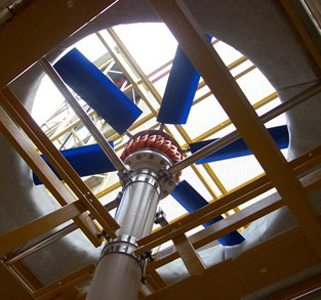 This energy is utilized in the fan/turbine assembly and converted into rotating fan energy. The fan draws the required quantity of air through the packing located immediately underneath the turbine. The distribution system generates excellent uniform water spread over the fill. Aquafan cooling towers do not have a fan motor, gear box or traditional bearings (lubrication of the system is provided by the water and Teflon bearing ring). Also no electric wiring to the cooling tower is needed. This results not only because of energy savings but also as the tower is made out of durable non-corrosive materials with a long lifespan meaning no discharge oil, motors, gear drives etc.